Between 1973 and 1876 Van Gogh spent nearly three years in Britain, living close to Stockwell in south London. He was only 20 years old when he arrived and spent most of his time working for an art dealer in Covent Garden. But while in the capital, he didn’t so much as pick up a paintbrush. Rather, his time in the UK might be understood as a research trip for the career he had not yet begun, or yet imagined he would be begin. Initially, Van Gogh was not overly fond of the British painters he found in the National Gallery and Royal Academy. Just after his arrival he wrote to his brother Theo: ‘English art didn’t appeal to me much at first, one has to get used to it.’ But he soon acquired a taste for Constable, Millais and Turner among others, and some of these names greet us in the opening galleries of this exhibition with a few early, tentative canvases by Van Gogh. But it takes quite a leap of imagination to believe that some of his most brilliant works were coloured by memories of gas-lit London nights or smoggy views of the Thames, as is suggested here. Van Gogh’s interest in British literature, however, is perhaps more significant than his evening strolls along the South Bank. He felt the plight of the down trodden deeply and read and re-read the works of Charles Dickens, stating, ‘My whole life is aimed at making the things from everyday life that Dickens describes.’ And Gutave Doré’s prints of poverty stricken London, of the cramped back yards and squalid streets, remained an inspiration for the entirety of his tragically short life. Despite his poverty, Van Gogh owned thousands of prints, but was especially keen on those depicting prisons. He seemed to have had an affinity for the inmates, especially during his stay at the Saint-Paul Asylum in France. In 1890, during this self-inflicted period of confinement, he painted his own version of Doré’s print of the prison yard at Newgate, the only painting, in fact, that Van Gogh ever made of London. The truth is that Van Gogh’s artistic story doesn’t really get going until some time after his short stay in England. It is in the company of Lucien and Camille Pissarro, under the rich, warm light of the south of France that his work evolves. The Pissarro canvases here are serene evocations of summer afternoons, painted with the tiny dashes of pointillism. Van Gogh tried to match their delicacy, but his expressive verve gets the better of him, and the dissolved forms give way to hard, energetic outlines. Much is also made of Van Gogh’s influence on British artists. There is a wonderful quote on the wall from the art critic Roger Fry (1866 – 1934). ‘Modern European art has always mistreated flowers,’ he said, ‘until Van Gogh saw … the arrogant spirit that inhabits the sunflower.’ But the British examples displayed next to Van Gogh’s paintings add nothing to our understanding of his legacy, nor are they particularly interesting. Van Gogh’s appeal – and his true genius – lies in his idiosyncratic approach and his daring. Any links drawn to British artists are tenuous. The curators only make a truly convincing case for the influence of British literature on the Dutch artist’s work. And, if visitors are expecting to be plunged into a world of intense, swirling brushstrokes of Prussian blue and bright oranges, they will be disappointed. This show dilutes the brilliant restlessness of Van Gogh’s curling skies and melting trees with too many barely related paintings. Inspired by Van Gogh’s vivid colours, Head Chef of Tate Britain's Rex Whistler restaurant, Alfio Laudani, has developed a tasting menu and reduced three-course lunch to celebrate the exhibition. When designing the menu (available 27 March to 11 August), Laudani focused on seasonal British produce, as a nod to Van Gogh’s time spent in England. But there will also be a Dutch twist, with the inclusion of ingredients such as pickled herring. The dessert with be a take on gevulde koek, a popular Dutch almond tart, accompanied by a vivid stroke of turquoise absinthe paint, a nod to the blues of Van Gogh's Starry Night on the Rhône and the alcoholic drink so loved by artists at the time. On 5 April, there will also be a wine tasting in the Grand Saloon, followed by dinner in the Rex Whistler restaurant, and visitors will be able to access the exhibition during this event. But you'll need to book, so get your clogs on! 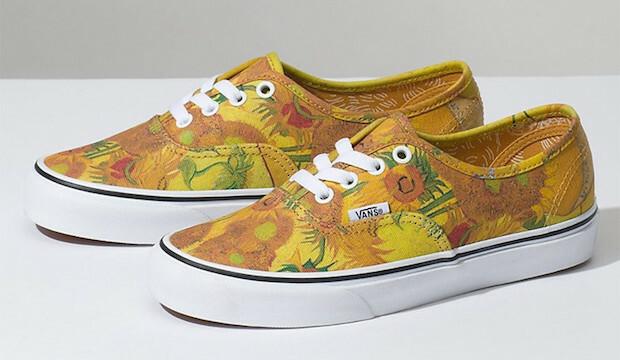 Ahead of the blockbuster Tate Britain Van Gogh exhibition in 2019, global footwear brand Vans has collaborated with the Van Gogh Museum in Amsterdam to bring us an exclusive clothing range decorated with the artist's most celebrated artworks. The collection – which is inspired by four main bodies of work: Skull, Almond, Blossom and Sunflowers – includes a pair of Vans Authentic shoes, enlivened by Gogh's vibrant Sunflowers, 1888. Hoodies, bomber jackets, T-shirts and hats are also available, each intended to bring the painter's works 'off the wall and into the world to a new audience', says Adriaan Donszelmann, managing director of the Van Gogh Museum. The collection is in stores now, but has unfortunately sold out on Vans.com. Quick!